iPhone 8 wireless charging: will you be able to juice it up without wires? Wireless charging isn’t a brand new feature on phones, but rumors of the iPhone 8 being able to charge without wires is exciting as it’ll be the first phone from Apple to embrace the technology. Popular phones have included wireless charging since 2012, including the Nokia Lumia 820 and Lumia 920, with the Nexus 4 from Google and the HTC Droid DNA soon following suit. Samsung’s flagship devices from the Galaxy S5 onward have also supported wireless charging, with the Galaxy S6 and Galaxy S6 Edge even being able to charge through two different types of wireless tech called Qi and PMA. Apple has previously used wireless charging for both the Apple Watch and Apple Watch 2, and the evidence is mounting high that with the iPhone 8 and iPhone 7S Apple will embrace the tech on its phone line too. Below we'll talk you through everything you need to know about wireless charging and whether we think it will finally happen on the iPhone 8. Samsung's Galaxy S6 being put onto a wireless charging pad. Wireless charging allows you to pump power into your devices without having to physically attach a cable through the micro USB, Lightning connector or USB-C port on your phone. It means you can just rest your phone on a pad and still have your device charging. This not only makes charging more convenient at home, but also means for example that if you’re desperate for power in a coffee shop that has charging pads built into the tables, you wouldn’t need to have your charger and cable with you. The basic concept for wireless charging tech works via electromagnetic induction. That means it uses an electromagnetic field to transfer the power between two objects. Here those two objects are your phone/device and the charger you'll be using. A wireless charger will have a transmitter coil inside it while the phone you're charging has a receiver coil built-in. The coil inside the charger will detect the phone's coil when it gets close enough and begin coordinating the magnetic field to create an electrical current between the two devices. An example of how you can charge the battery for IKEA's wireless charging furniture. This is the reason why your phone needs to be so close to the charger to be able to charge, as it needs to be in range of the magnetic field. The tech is safe and has been tested thoroughly, so you shouldn't be worried that this is something brand new and still in development. There are two standards for wireless charging. There's PMA and Qi - both are very similar but each uses different frequencies for transmission. We expect Apple to use Qi, which is the generally more popular option for wireless charging on phones. Why do we expect it to be on the iPhone 8? Lots of rumors have suggested the iPhone 8 will come with wireless charging. Perhaps the biggest hint at the new tech was Apple joining an organization called the Wireless Power Consortium. That’s the overseeing body for the standards of over-the-air charging tech and Apple joined as a partner at the start of this year, joining firms such as Samsung, Sony, LG, Huawei, HTC and many others. Since then, further leaks of the iPhone 8 design have hinted toward wireless charging features. 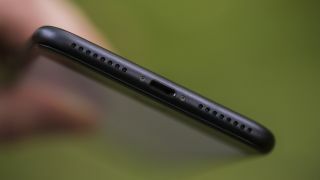 One leak of the iPhone 7S Plus suggested that phone would be launching with a glass back, which would allow for wireless charging, as manufacturers struggle to get the tech to work in phones with full metal jackets. Apple HomePod firmware seemed to also confirm the iPhone 8 would come with wireless charging too, with code suggesting the phone will tote the tech. Here at TechRadar we are relatively certain the iPhone 8 will come with wireless charging tech built-in. One rumor in July this year did suggest Apple may not have the tech ready in time for the launch of the iPhone 8, but there is a lot of evidence to the contrary. As late as the start of August 2017, a leaked photo on Chinese social network Weibo shows an x-ray of the iPhone 8 with a large metal receiver coil in the center of the phone. It's expected this coil is part of the tech used to supply wireless charging. Here at TechRadar we are relatively certain the iPhone 8 will come with wireless charging tech built-in. We're less clear on whether it will feature on the rumored iPhone 7S and iPhone 7S Plus, but the rumors are so numerous now it suggests Apple is finally ready to push this tech. We won't know for certain though until the launch of the next iPhone, which is expected at some point in September or even October this year. Previously we've heard rumors of Apple working on long range wireless charging tech that would allow you to charge your phone anywhere in a room, but we don't expect that to be ready for the iPhone 8 or anytime soon. Will the iPhone 8 make wireless charging popular? The truth is, no-one knows for certain. Having wireless charging on some of the most popular phones in the world will likely see coffee shops, restaurants and other meeting places sit up and take notice of wireless charging. That may mean we're more prone to seeing charging tech built into tables, desks and other accessories in public places. Apple sold over 41 million iPhones around the world in Q3 2017, so it would make sense for accessory and furniture manufacturers to sell more wireless charging devices if it's going to be a feature on upcoming iPhones. IKEA's current range of wireless charging compatible furniture. Some furniture manufacturers are already producing items for your home that can wirelessly charge, including IKEA, so you can likely expect to see more of those sorts of devices on the market if the iPhone embraces the tech. In the UK, we've even seen furniture retailer Benson for Beds start selling wireless charging tables and with more and more shops getting onboard with the tech it'll be easier to kit your house out with compatible tech. The iPhone 8 will likely make wireless charging a lot more mainstream if it does come with it, so expect some public places and retailers to embrace wireless charging further very soon.